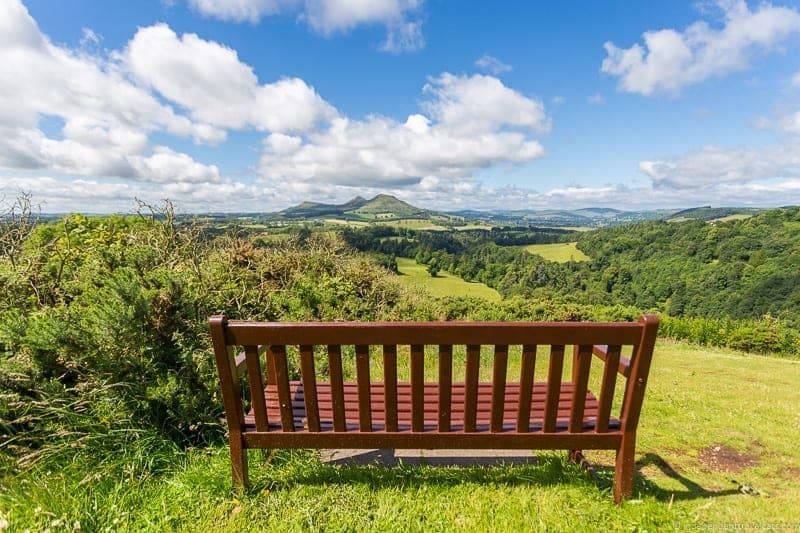 A visit to the Scottish Borders is an easy day trip from Edinburgh, and allows visitors to get a glimpse into a relatively unknown region of Scotland. The Scottish Borders is region located in the southeast part of Scotland, with the Southern section forming part of the border with England. It is sparsely populated, largely rural, and covered with rolling hills, wild moorland and meandering rivers. Like in many regions of Scotland, you’ll find historic towns, ruined abbeys, castles, footpaths, gardens, and farmland. 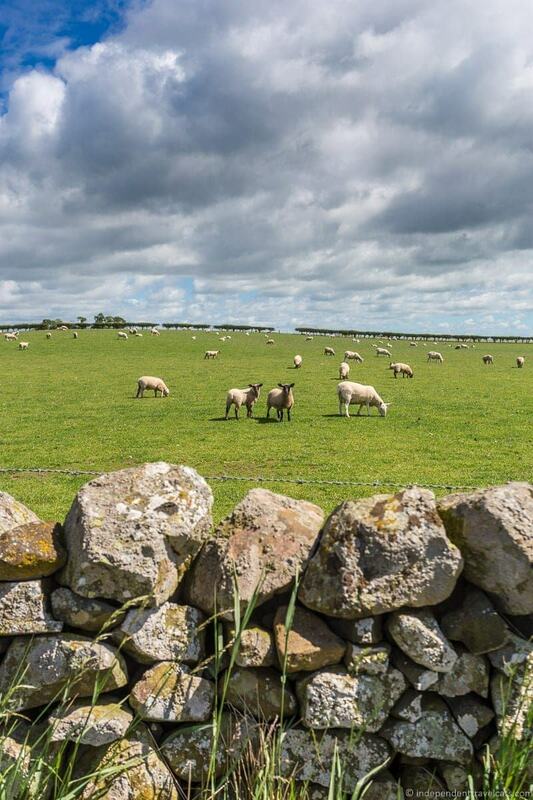 The Scottish Borders is well known for its agricultural and food products, often referred to as Scotland’s natural larder and fresh local produce and farm-to-table meals are easy to find here. Short and long distance walking paths crisscross the entire region and are a great way to explore. Just south of the Borders, you can also visit the UNESCO heritage site Hadrian’s Wall and loads of places steeped in Roman history. The Scottish Borders is also the region of Scotland that perhaps had the greatest influence on the famous Scottish writer Sir Walter Scott. Scott spent much time here as a young boy and then later built his family home here, the impressive Abbotsford House which is today open to visitors. We got a great taste of some of the highlights of the Scottish Borders on two recent day trips we took from Edinburgh with Rabbie’s Trail Burners. We’ll share our experience on those two trips as well as the highlights from our time spent exploring the Scottish Borders. 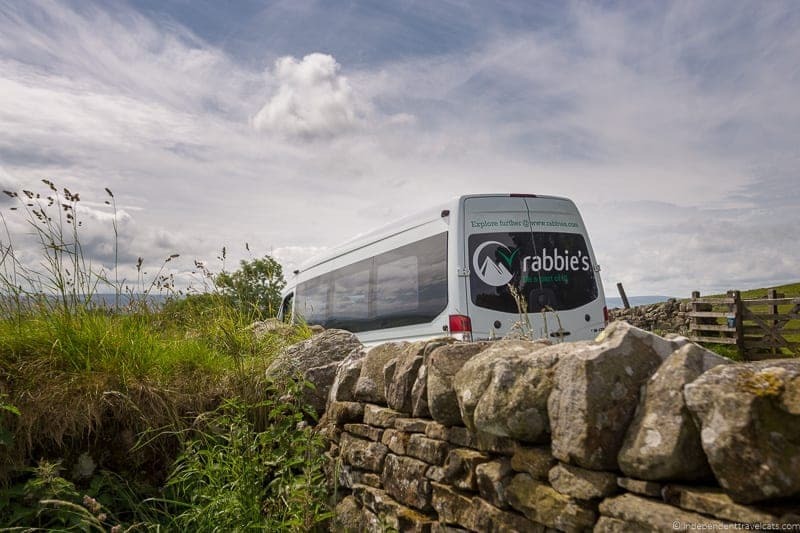 Rabbie’s was first started by Robin Worsnop in 1993 as he wanted people to be able to explore Scotland’s beautiful scenery in small group bus tours. He started the company as the sole driver with a single second-hand Leyland DAF minibus. Today, Rabbie’s (officially Rabbie’s Trail Burners) employs over 60 driver guides and continues to run small group (maximum 16 passengers) bus tours throughout the UK and Ireland with a large fleet of 16-seat Mercedes mini-coaches. The company is based in Edinburgh but also operates tours from Glasgow, Dublin, and London. Rabbie’s and its founder have won numerous awards including the Scottish Tourist Board’s 5 Star Award. Rabbie’s offers over 60 different tours within the UK and Ireland, including one tour to northern France. The majority of tours focus on Scotland or northern England but the tours explore all the main regions within the UK. Tours range from a city tour of Edinburgh to 17-day tours. Rabbie’s is also happy to arrange a private tour or customize an existing tour for almost any size group and can also arrange for a tour guide who speaks the language of the group if they are non-English speaking, just contact them well in advance with your request. 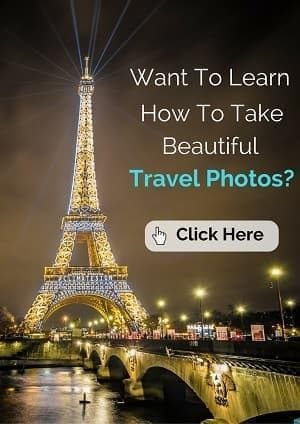 They can also help you book multiple connecting tours so you can do more than one tour right after the other. 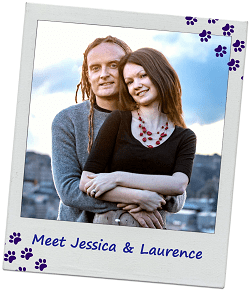 They can also arrange tours for those wanting to explore their ancestral heritage. All group sizes are limited to 16 passengers and they can also arrange private tours with advanced notice. One great thing about Rabbie’s that is not true of most other tour companies is that when you book a tour, the tour is guaranteed to run no matter how many other people book that tour. All the tours will run with only one or two persons on them even if the company has to take a loss on the tour. We had groups of 15 or 16 on three of the four tours we have done with Rabbie’s, but only 4 persons (so only 2 other people) on our Best of the Borders tour. Our guide on our Highlands Explorer tour this past week was telling us that he has once done a 5-day tour with only one passenger! Whereas it is unusual for a group to have only 1 person booked, this is a fantastic guarantee as so many people plan their holidays around the multi-day tours and it would be a shame to learn at the last minute that a tour won’t be happening after making travel arrangements. With Rabbie’s you don’t have to worry about that! 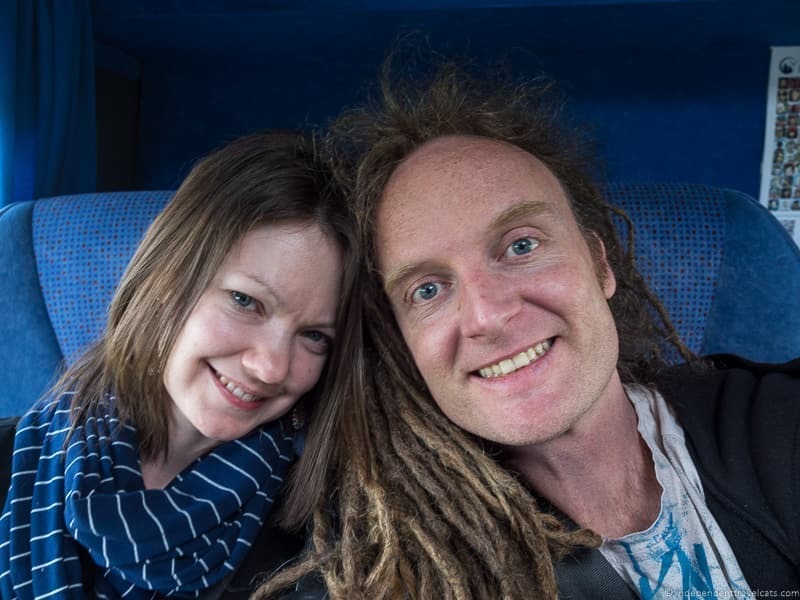 The tours are geared to people looking for a small group bus tour of the UK. They are designed to cover the highlights of an area or region and also take in some of the lesser known sites. We have now taken four Rabbie’s tours and the passengers range from children to the elderly. There have been a lot of young and middle-aged couples, friend groups, a couple of families (children not permitted on all tours such as the whisky tours), and a few solitary travelers of all ages. Mobility levels of fellow passengers have also varied greatly although for many places we visited (e.g., beaches, historical homes, hikes) access can be limited for those with serious mobility restrictions. Those with mobility restrictions or handicaps should contact Rabbie’s in advance to help choose the best tour options and to make sure appropriate overnight accommodation is available. Based on our experience, a lot of the passengers are European, American, or Asian with a few Brits, Canadians, and other nationalities thrown in on each tour. All information is given in English unless you book a private tour so it is good to have at least a moderate level of English comprehension to really get full value from the tour, especially the multi-day tours. However some passengers who spoke limited English, especially on the day tours, seemed to be using the tour more as a convenient transport option rather than a tour so that works too! The driver also acts as a guide and gives lots of information on the bus while also sometimes providing some guided walks or visits off the bus. However, generally you are given tips and advice on where to go and are then left to wander on your own or explore an attraction at your leisure or with the attraction guide (e.g., a house or castle tour). This gives you a lot of flexibility as you generally have the option to do more than one thing (e.g., tour a castle, shop, or go for a hike) or even stay on the bus and rest if you wish. There are usually a few major stops each day (generally 30 minutes to 1.5 hours a stop) and a few photo stops as well as lunch and restroom breaks. There is also often flexibility for the driver to substitute or add stops depending on weather, road conditions, and group interests. The driver guide is happy to help provide a bit more assistance for those who need it, but the tours are designed for people who want to have some independence during the trip. Most meals, attraction fees, and overnight accommodation fees are generally not included in the tour costs, so do read the fine print so you are clear what is covered and what is not for any particular tour. This provides flexibility for travelers to choose what and where they eat (although at times there may not be more than one restaurant option), whether they visit an attraction or not, and what type of accommodation fits their style and budget (hostel, B&B, and hotel options are generally available). Accommodations are generally pre-booked by Rabbie’s (tour participants will be staying at various locations in the town), but tour participants can also request to make their own bookings themselves. How do I make a reservation or contact Rabbie’s Trail Burners? The easiest way to make a reservation is online at https://www.rabbies.com or via phone at +44 (0)131 226 3133. If you are in Edinburgh, you can also come by the Rabbie’s Cafe (Waterloo Place, Edinburgh, EH1 3EG) for tour information. You can also find them on Twitter, Instagram, and Facebook, or reach them via their contact page. More information about the Scottish Borders region? 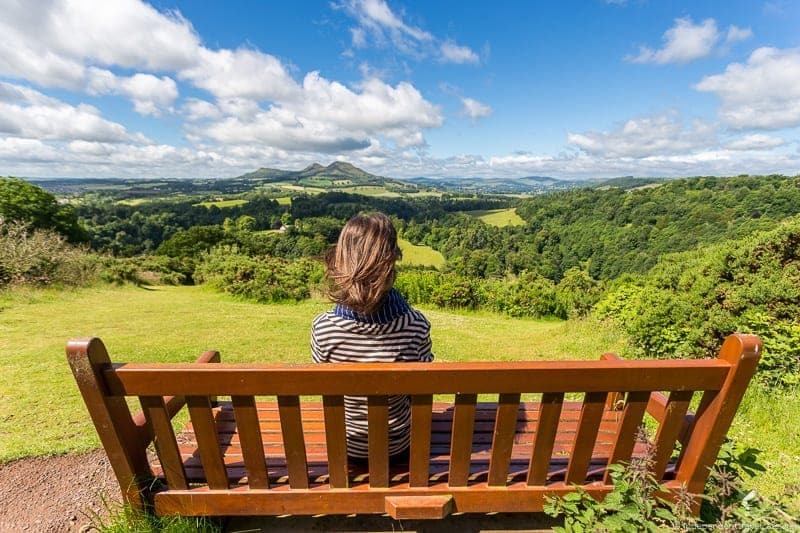 Whether you are deciding on which Scottish Borders tour to take or you are thinking about planning your own independent trip to the Scottish Borders, the Visit Scotland website might come in handy. For those interested in walking or hiking in the area, I’d also check out this informative walking online guide to the Borders. There are also several good Scottish Borders guidebooks and maps and many books focused on the best walks in the region. We have taken a total of four tours with Rabbie’s, three of them being day tours from Edinburgh and one being a multi-day tour into the Highlands. You can read Laurence’s coverage of our Discover Malt Whisky Day Tour that included a visit to two whisky distilleries, a castle, and beautiful Loch Lomond. This post will focus on discussing two day trips that took us into the Scottish Borders, one being the Hadrian’s Wall, Roman Britain, and the Borders day tour and one being the Best of the Borders day tour. Rabbie’s currently offers a few different Scottish Borders day trips from Edinburgh so you can definitely find one that suits your interests! Unfortunately, there are no overnight or multi-day tours of this region yet. Over the course of these two day trips we explored a number of towns and sites in the Scottish Borders and even jumped over to Northumberland in northern England. 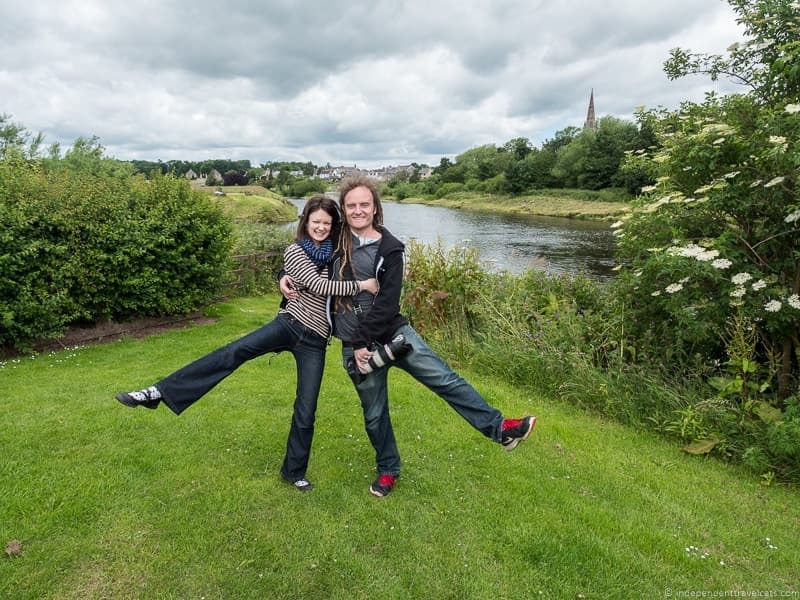 I can’t write about everything we did but I will cover all the highlights of our Scottish Borders tours! Our first tour departed by bus from the Rabbie’s Cafe and our second one started with a rail journey (included in the price of the ticket) from Edinburgh to meet our driver at the Galashiels train station. Our driver guide on both tours (pure coincidence) was Ally, a talkative and friendly guy who was very knowledgeable about Scottish history and all the places we visited. He was also very easygoing and on the day we had a small group, he squeezed in a couple of extra short stops along the tour since our small group was quick in getting in and out of places. We have found all the Rabbie’s driver guides to be wonderful. Each has different backgrounds and personal foci (e.g., history, nature, wildlife, literature, Scottish clan history, photography) so you get a slightly different focus depending on your driver but all cover the items on the itinerary of each tour. There was enough time to have a quick lunch (although not rushed) during both tours and also plenty of restroom breaks. The buses are comfortable and clean, although I’d advise sitting closer to the front if you can as it is a bit less bumpy and you can get off the bus a bit faster at each stop. As noted earlier, our Scottish Borders tour actually started with a train ride! Recently ScotRail began offering new rail journeys from Edinburgh to several Borders towns as far south as Tweedbank. We boarded a ScotRail train at Waverley Station in Edinburgh and took the train for about an hour to Galashiels, and the train trip was included in the tour price. This new rail line has made the Borders towns more accessible to those without cars. Our Rabbie’s driver then met us at the Galashiels train station to start the tour. 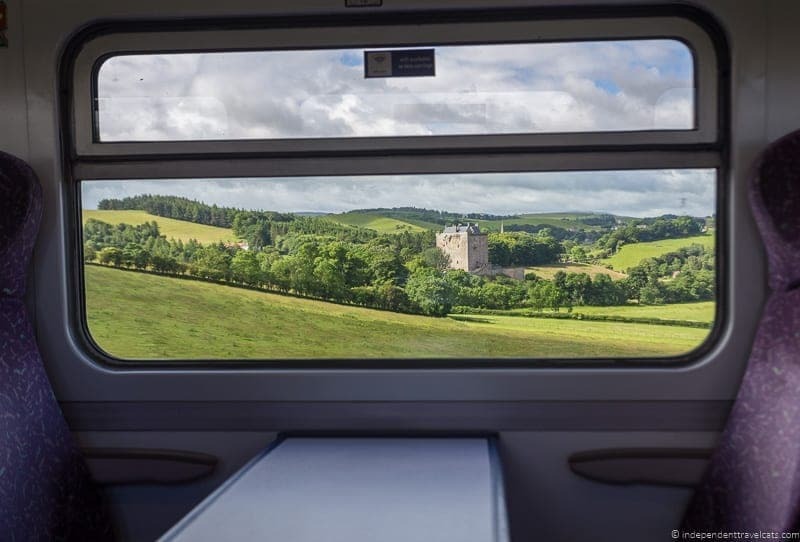 The train ride is great way to relax and see some of the Scottish Borders scenery with no worries about being stopped in traffic getting out of Edinburgh. At the end of the tour, the driver can make stops to drops off passengers at either Galashiels or Melrose depending on interests. Melrose is a town located near Galashiels and those interested in exploring it can then get a taxi or bus back to Galashiels to catch the train back to Edinburgh. We actually visited Jedburgh twice, it was included on both of the Borders tours we did with Rabbie’s. This was the only place we stopped on both tours, and we were happy to do so as there are a few noteworthy things to explore in this town. Jedburgh is a typical Borders town that was once a royal burgh, meaning it had a royal charter. Jedburgh, like many of the Borders towns, holds a festival to celebrate the brave young men and boys (called callants in Jedburgh) who once helped patrol the area to ward off attacks and raids. During the summer, the Jethart Callants Festival is held over a 2-week period, marked by several traditional Common Riding events and other local events. You find the Common Riding events celebrated all over the Borders region in several towns. There are four things we can recommend doing in Jedburgh depending on your time and interests: stroll through the town center which is easy to walk around and pop into the peaceful Greyfriars Garden, visit the Jedburgh Abbey (fee), visit the Mary Queen of Scots House (free), and walk up the hill to see the Jedburgh Castle Jail Museum (free). 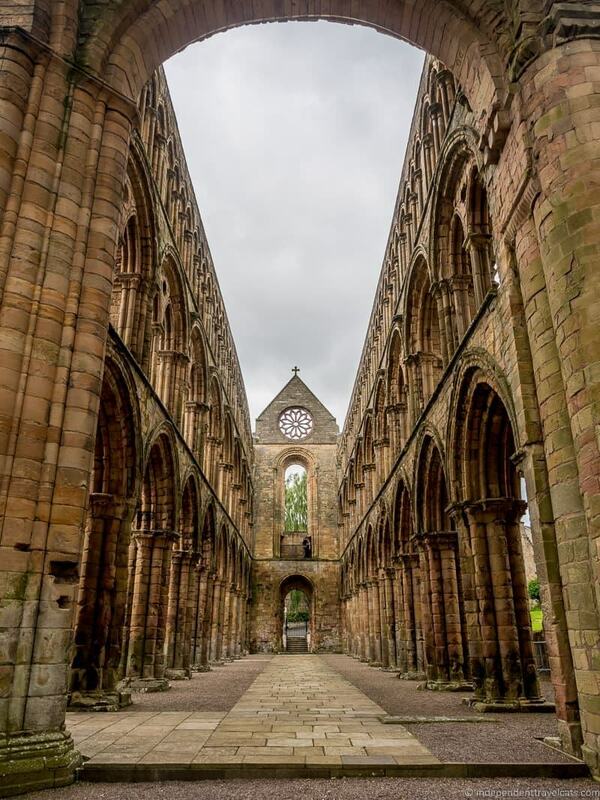 The Jedburgh Abbey is a 12th century ruined Augustinian abbey built by King David I of Scotland. 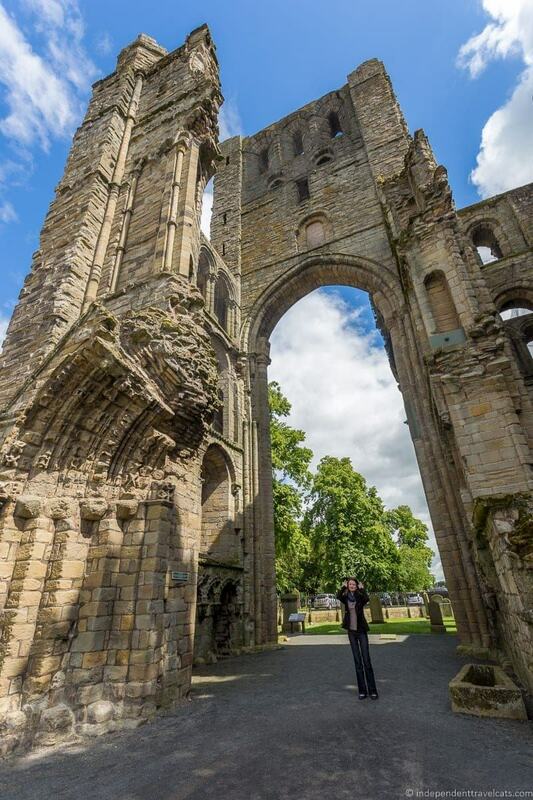 The included audioguide narrates the story of the abbey, its impressive ruins, and the small exhibition room. The Mary Queen of Scots House is perhaps a bit of an ambitious name for this 16th century house museum as it never belonged to the queen or was one of her residences. The house is believed to have been built in the 1540s by the Kerr family of Ferniehirst. 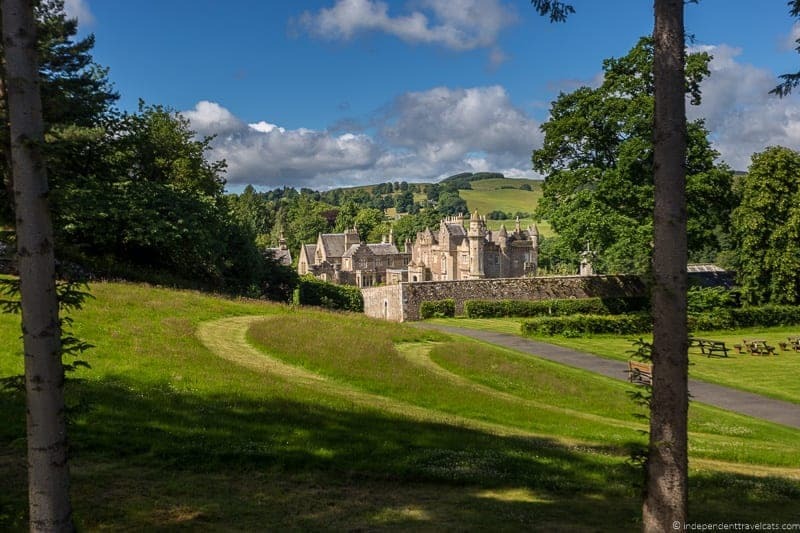 However, Mary Stuart did come to Jedburgh to hold a Circuit Court and is believed to have stayed at this house in 1566 to recover from an illness after returning from a long ride to see the wounded James Hepburn, the Earl of Bothwell. 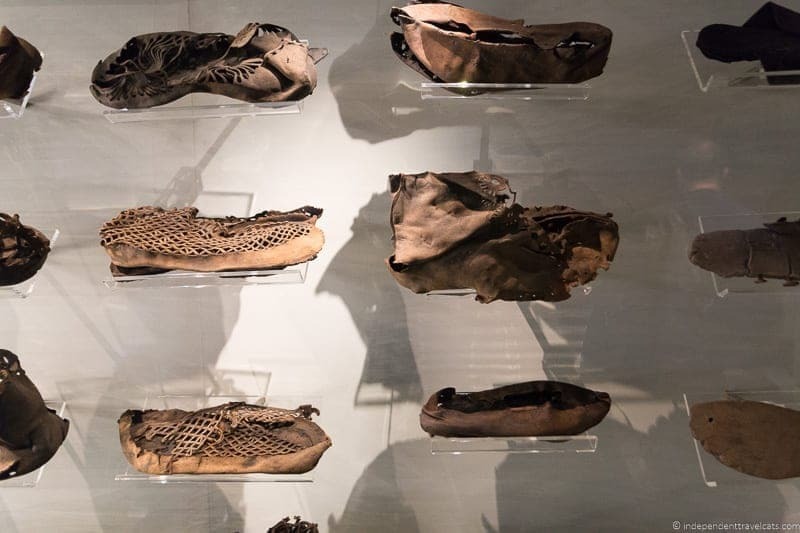 The house museum includes the full life story of Mary, Queen of Scots as well as artifacts related to the queen, including documents, a shoe, a watch, and her death mask. A great place to visit for anyone interested in Mary Queen of Scots. 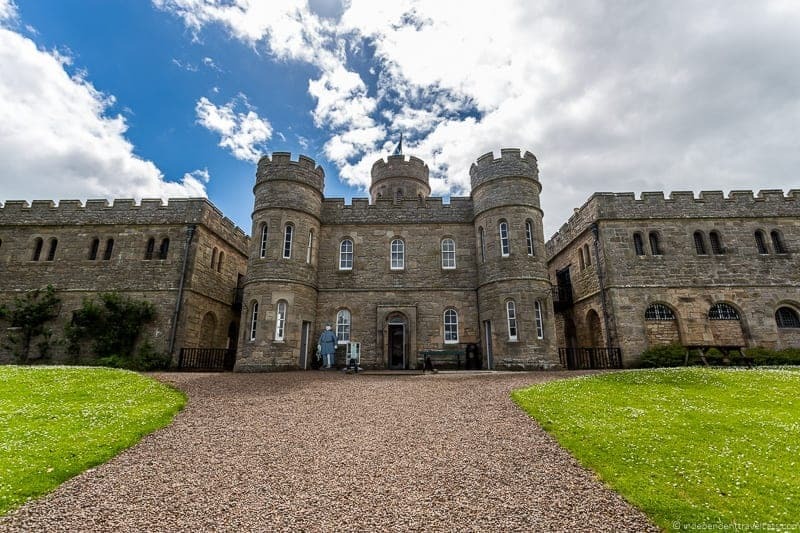 The Jedburgh Castle Jail and Museum looks like a castle from the outside but is actually a Howard reform prison built in the 1820’s on the site of the former Jedburgh Castle (destroyed in the 15th century). Today is it is a museum that provides information both on the history of Jedburgh and 19th century prison life. 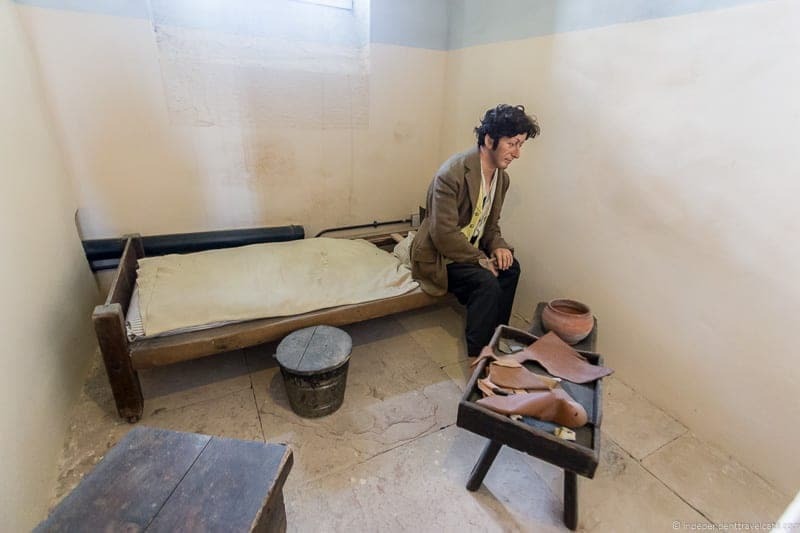 The building is the only existing example of a 19th century prison of its kind in Scotland and does a good job of helping modern visitors understand the lives of prisoners from the period. I would allow at least 30-45 minutes per attraction in terms of visit times, and one could easily spend a day exploring Jedburgh. 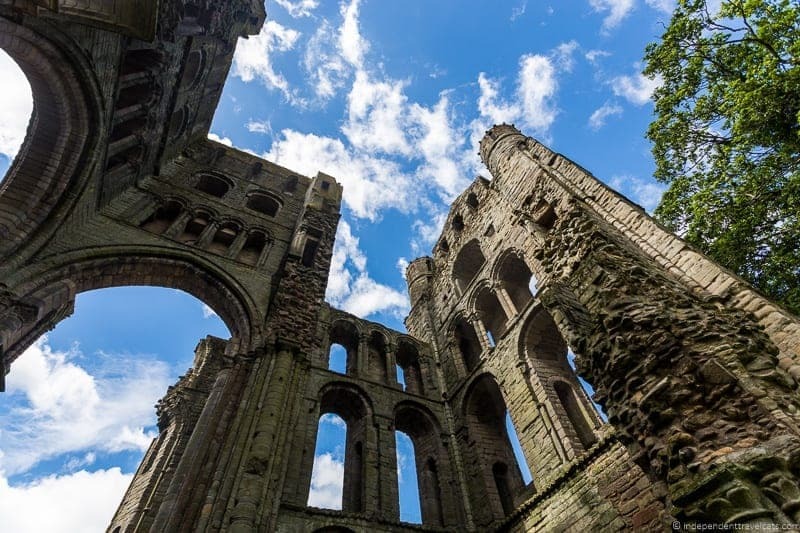 We visited all the above attractions, and Jedburgh Abbey is probably our top pick if you only have time to visit one place during your time in Jedburgh although we found they were all worth a visit. Kelso is a Borders market town and sits at the meeting point of the Rivers Tweed and Teviot. 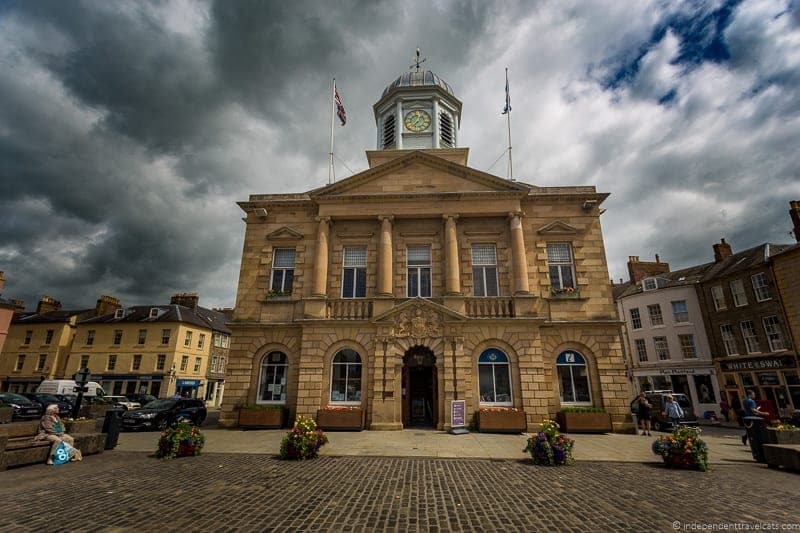 We had only a short break here but can recommend exploring the large cobbled market square and shops, visiting the ruins of Kelso Abbey (free), and walking over to the banks of the River Tweed to see the Kelso Bridge. There are several cafes and restaurants located around the market square where you can get a meal or coffee. The Kelso Abbey was founded in the 12th century by a community of Tironensian monks but became inactive in the mid-16th century during the reign of King Henry VII. There were some cute baby birds in a nest on one of the ledges during our visit. The Kelso Bridge was engineered by John Rennie who also designed the 19th century London Bridge and from the bridge you also get a glimpse of the 18th century Floors Castle. We’d love to return to visit Floors Castle (open to public for a fee), which is the seat of the Duke of Roxburghe and is the largest inhabited castle in Scotland. As in many towns in the Scottish borders, Sir Walter Scott spent time in Kelso as a boy and young man, both visiting his family at the Rosebank Estate and attending Kelso Grammar School. 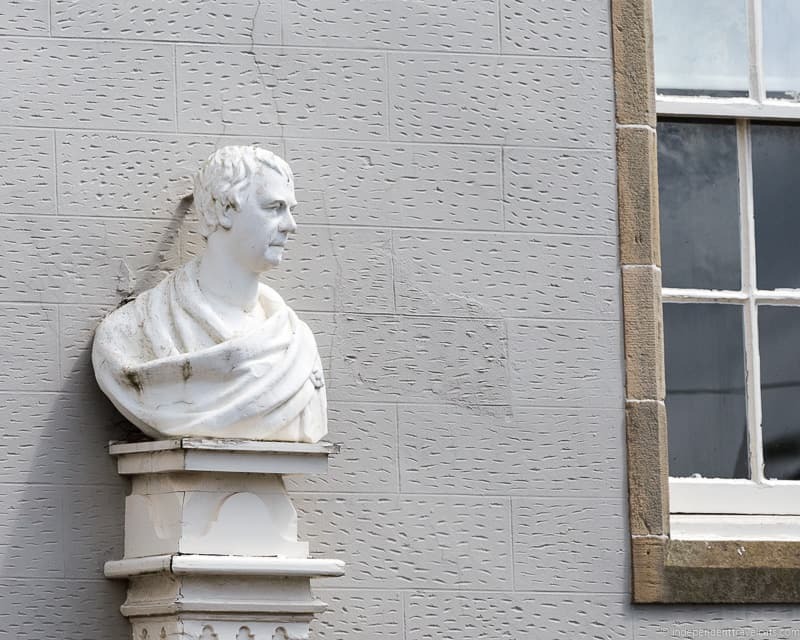 You’ll find a bust of Sir Walter Scott in the gabled wall of the Waverley Lodge (incorporates a cottage on which Scott stayed in the 18th century with his aunt) which sits on land that was once part of the Rosebank estate. The Scottish Borders and its traditions served as a great inspiration for famous Scottish writer and poet Sir Walter Scott. Scott was born in Edinburgh but spent a lot of time in the Borders towns as a child and young man with his family and later built his home Abbotsford House in the Scottish Borders. 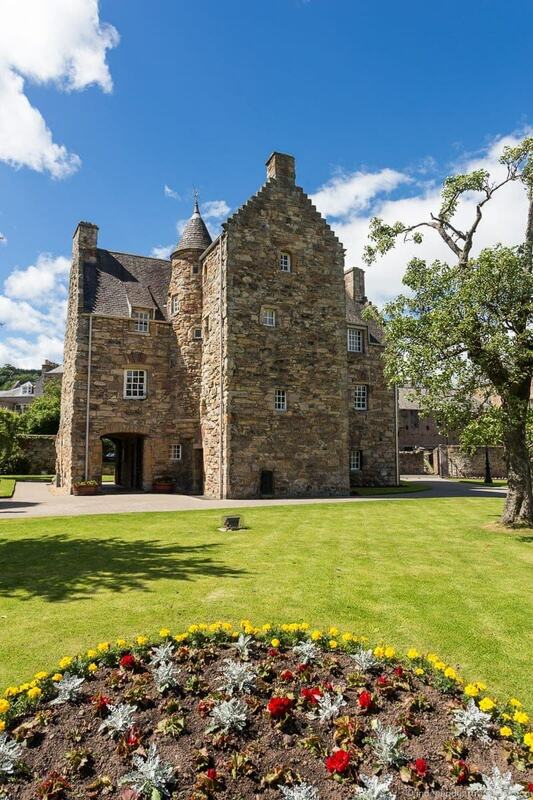 Abbotsford was built over 3 major phases and is built in 19th century Scottish Baronial style. Other places closely associated with Scott include the towns of Selkirk, Melrose, and Kelso, Smailholm Tower, Scott’s View (one of his favorite scenic views), and Dryburgh Abbey (where he and his wife are buried). 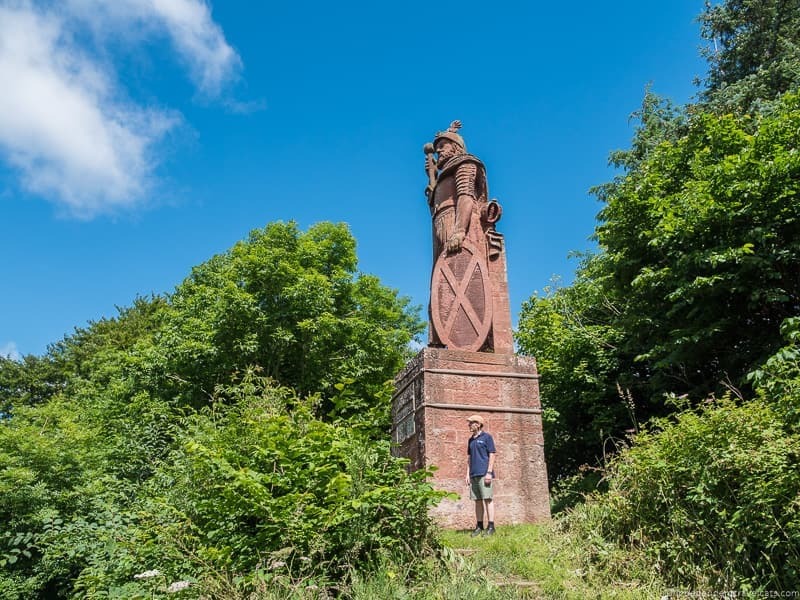 Hidden away in a field on the ground of the Bemersyde estate near Melrose is a large 31-foot red sandstone statue of William Wallace. The name of the 13th century Scottish hero William Wallace may or may not mean anything to you, but if you have watched the film Braveheart, he was the man portrayed by Mel Gibson (note: Braveheart is the nickname for Robert the Bruce not Gibson’s character). This statue was made by John Smith and was unveiled in 1814; it was originally painted white but the paint is mostly gone now. The statue is not particularly well-regarded from either a realistic standpoint (inaccuracies in clothing) or artistic one, and was largely forgotten about until its renovation in 1991. 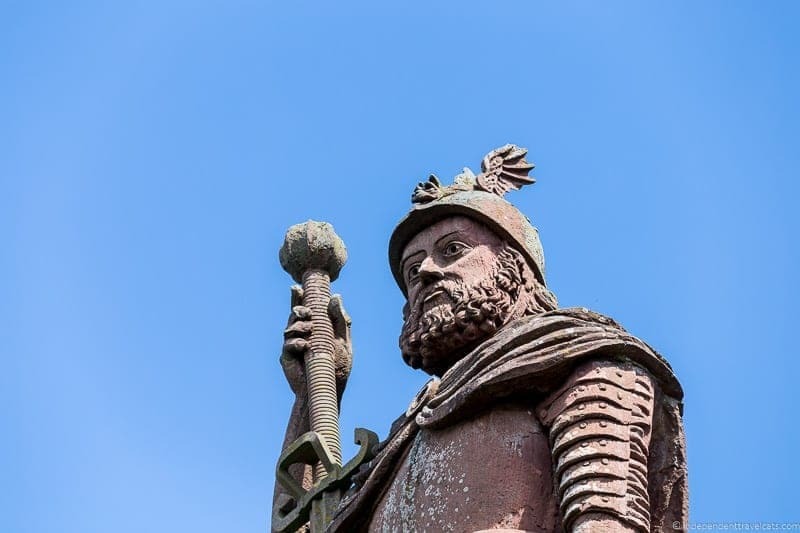 This statue is older than the more famous statue at Stirling and is often referred to as the original Wallace statute. It is definitely a large dominating statue and we enjoyed the short 10-minute woodland walk to get here and learning a bit more about Sir William Wallace from Ally. If you come on your own, there is a small parking area where you can park and then go through the gate and follow the path to the statue. The Scots love their heroes, and there are several other Wallace statues in Scotland, including the one by sculptor Dwight Watson Stevenson (1859-69) at the National Wallace Monument in Stirling (recommend a visit here if you are a Wallace fan), one by William Grant Stevenson in Aberdeen, and at least two statues in Edinburgh. Interestingly, a new statue of Wallace was commissioned in Stirling in the 1990’s. When the new statue named “Freedom” was unveiled by Tom Church in 1996, locals were outraged as the statue portrayed Mel Gibson as Wallace rather than the historical real-life Wallace! The statue was eventually sent back to the sculptor after becoming a regular target for vandalism and has not been publicly displayed since 2008, but you can find images online if you do a search. 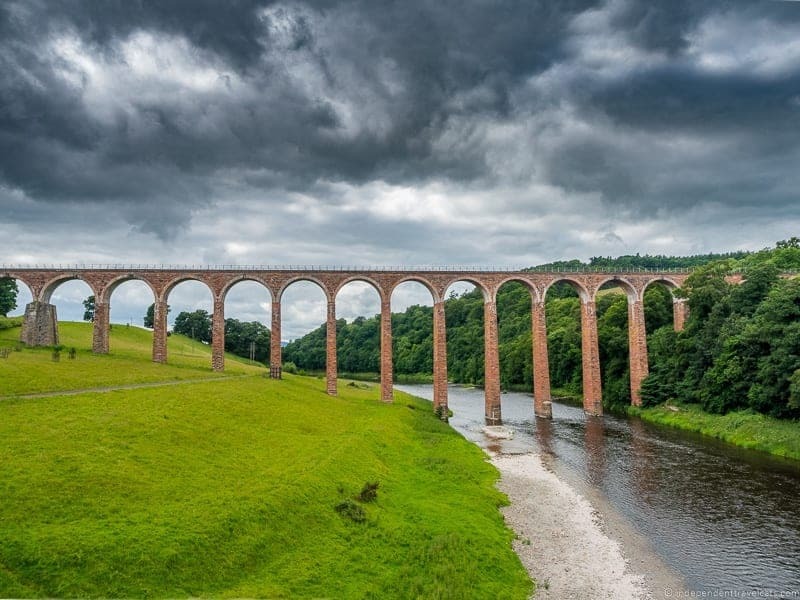 The Leaderfoot Viaduct is a railway bridge over the River Tweed located near the town of Melrose. It was constructed in 1863 out of stone and brick and has nineteen 43 foot spans with semi-circular arches. The narrow bridge is no longer used but it was renovated in the 1990’s in order to preserve this historical viaduct. It was a great place for a short photo stop on our tour. We also met some local hikers here and learned that is also a good place for a short or long hike as you can walk from the viaduct to the historical Roman settlement of Trimontium and the Drygrange Old Bridge built in 1776. The Leaderfoot Viaduct is also included on a few of the local walking routes in the Borders. 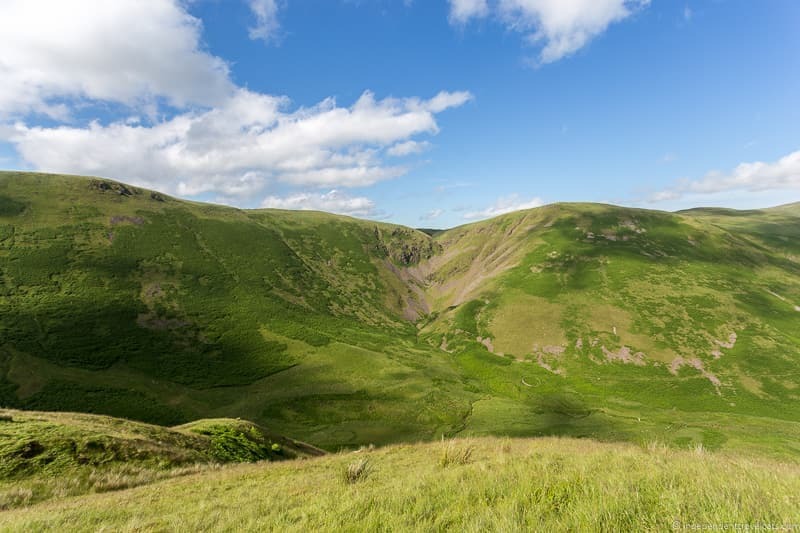 We’d definitely love to return to do some of the walking routes in the Scottish Borders. Carter Bar, also called Carter’s Bar, does not in fact serve any alcohol. Instead, it is a point on the border between Scotland and England. You can straddle the border, with one foot in Roxburghshire (Scotland) and one in Northumberland (England). This official modern England-Scotland border was established in 1237 by the Treaty of York. Today, there are two large rocks here noting the border, a small tourist kiosk stand, some flags, and some final (or first) scenic views of the Scottish Borders. The spot also has some historical significance as in 1575, one of the final major battles (Raid of the Redeswire) between the English and Scottish took place here. There is not too much to see here but it is a good photo op and a good place to stretch your legs. Hadrian’s Wall was a defensive fortification built by the Romans in the northernmost part of the Roman province of Britannia. It is believed that it was started in 122 A.D. during the reign of Emperor Hadrian and although it was less frequently used by the Roman over time, it was still used by the Romans until they left Britain in the early 5th century. Hadrian’s Wall spanned 73 miles (80 Roman miles) from Wallsend in the east to the Solway Firth in the west. The stone wall had 80 milecastles, numerous observation towers, and at least 14 larger forts. 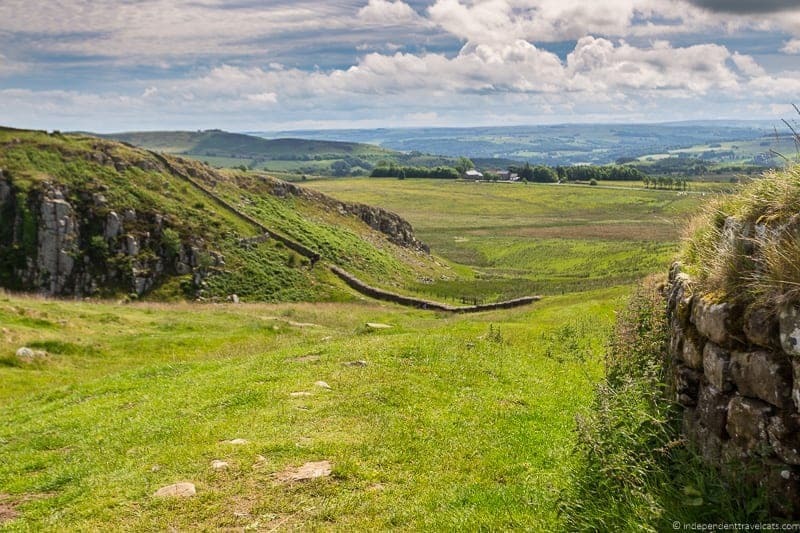 Today Hadrian’s Wall is situated in northern England and is a UNESCO World Heritage Site. It has become a popular tourist attraction, and it is popular for visitors to walk, bike, take a bus, or drive along sections of the wall. It takes about a week to walk from one end to the other with about 15 miles of the original wall still standing along the path. The wall is quite fragile, as is the surrounding ground, and it is recommended that the footpath only be used in summer and that visitors refrain from walking or sitting atop of the historic wall. For those interested in walking the wall, I’d advise picking up a recently written/updated guidebook about walking Hadrian’s Wall for maps, tips, and eating/sleeping recommendations. 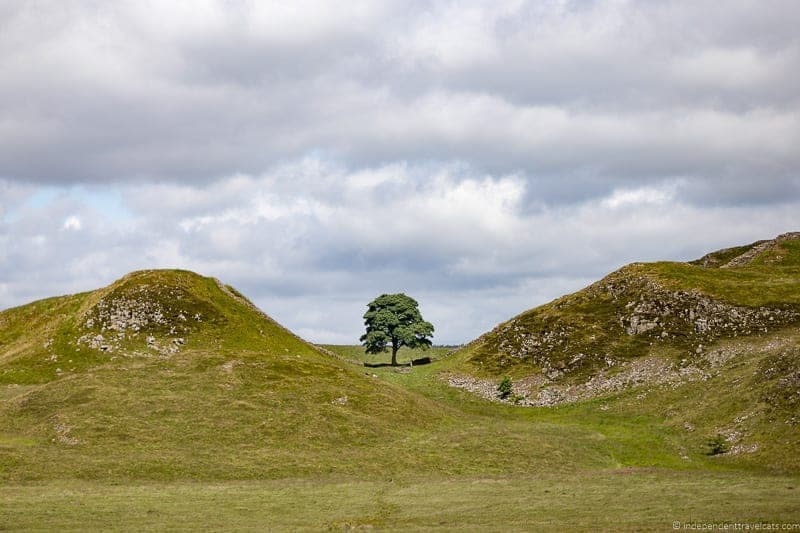 We drove along the old Roman Dere Street which runs along part of Hadrian’s Wall and along the way we saw the the famous Sycamore Gap in the wall in Northumberland England. Sycamore Gap is popular because it is scenic spot, but also because of the film Robin Hood: Prince of Thieves (Kevin Costner & Morgan Freeman were featured in a scene here). 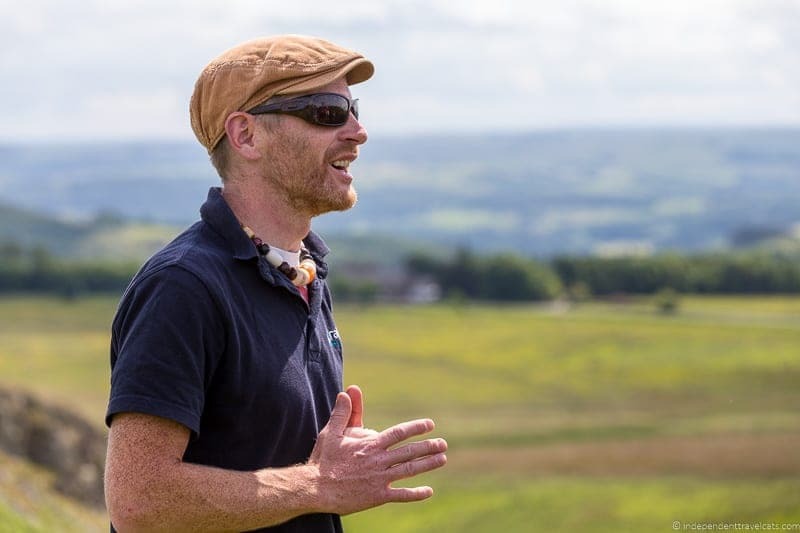 We then stopped at Steel Rigg where our driver Ally gave us some information about the wall and its purpose and then gave us some time to walk along a section of the wall and take photos. I do wish we had more time at the Wall and to walk further along it as there were a lot of other people at this section when we visited. 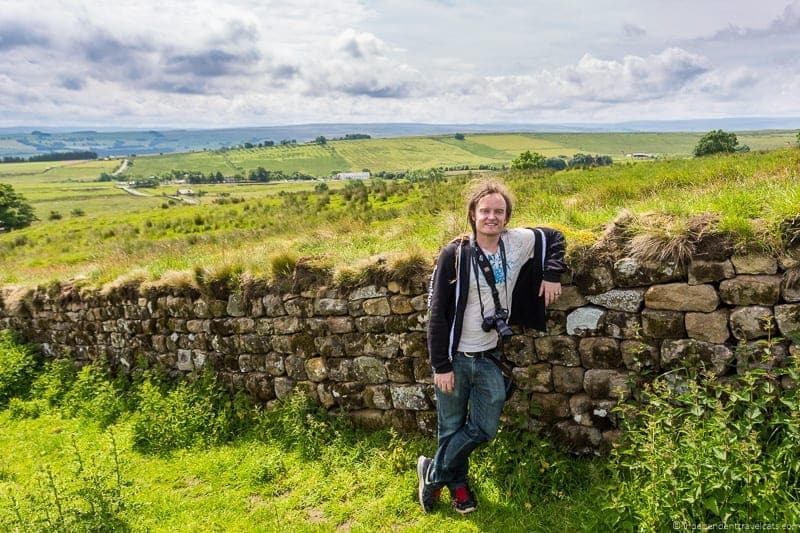 Games of Thrones fans will likely know, or be interested to learn, that the Game of Thrones book series written by George RR Martin was inspired by Hadrian’s Wall. Next we went to visit the remains of one of the Roman forts, Vindolanda, which also contains a good museum on Roman history. 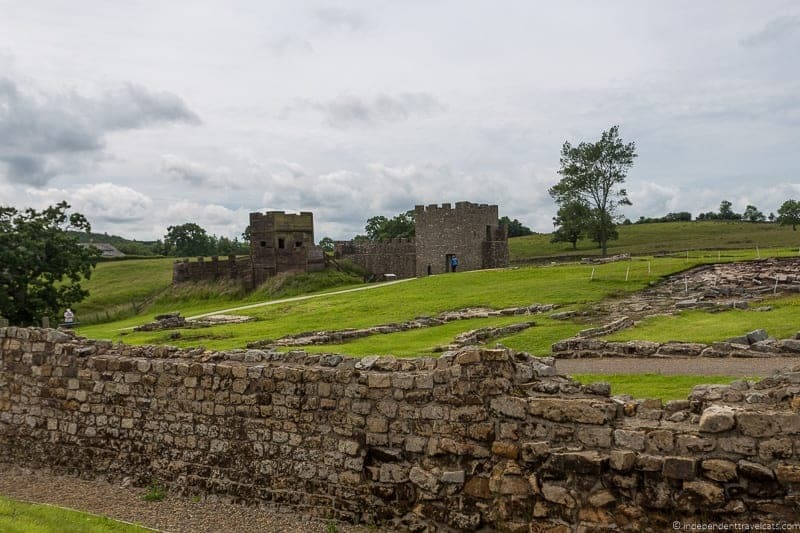 There are several other fort ruins you can visit in the area, but the Roman auxiliary fort of Vindolanda is one of the most popular along with the National Trust run Homesteads Fort. 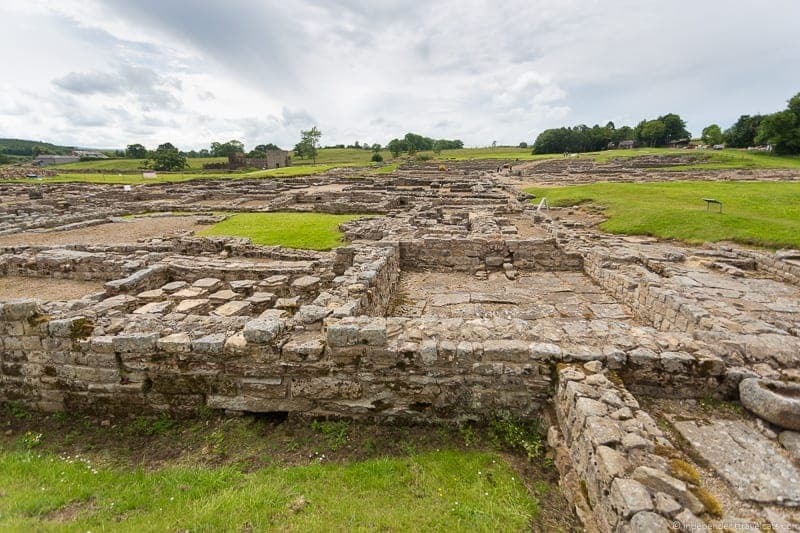 The archaeological site at Vindolanda contains remains of a bath house, residences, barracks, temple, and other areas. It is still an active excavation site so you may get to see digging in action during the summer and there is also a reconstructed section of Hadrian’s Wall to see what it would have looked liked during the time of the Romans. Additional ruins and artifacts are being discovered here almost daily it seems and I was amazed by the number of artifacts found here! The museum contains lots of information and some amazing Roman artifacts, including bones, shoes (so many shoes! ), jewelry, pottery, weapons, coins, and the oldest surviving handwritten documents in Britain. In addition to the Roman Vindolanda site, there is another nearby museum, the Roman Army Museum which is also run by the Vindolanda Charitable Trust and you can purchase joint tickets if you have time for both attractions. There is also a decent cafe here where we all ate lunch and Laurence and I also shared an ice cream on the patio. The Scottish Borders region is well-known for its agricultural and food products and is sometimes referred to as Scotland’s larder. 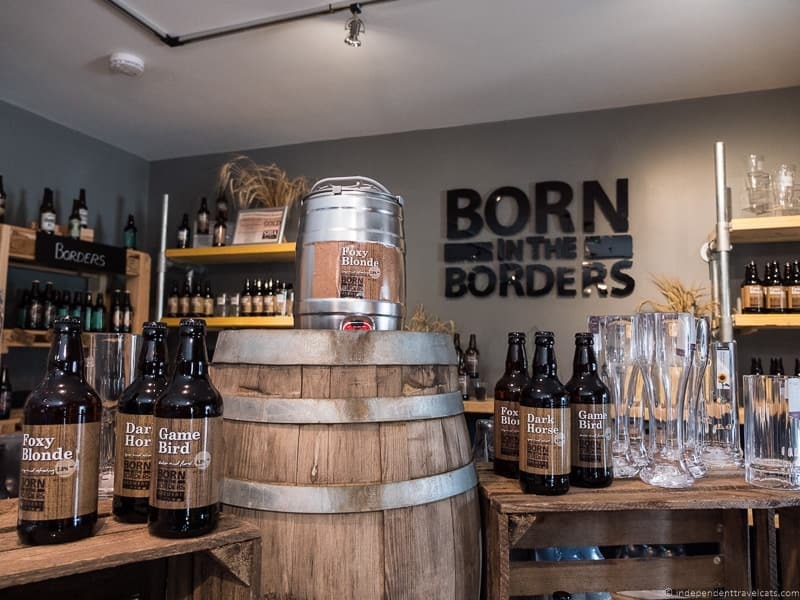 So Ally made a brief stop at Born in the Borders, which is a craft brewery, cafe, and gift shop that specializes in locally sourced Borders produce. We visited the brewery to learn about how the beer is made and then had samples of three of their beers. We also explored their food and gift ship which has a lot of local products and beers from all over the region. Born on the Borders is located on the edge of River Teviot and if it is a nice day, you can take a walk around the property and have a lunch outside. The café and restaurant looked like a nice spot to have lunch or coffee, but it was just closing as we arrived. We had a brief stop in Moffat during our tour to explore this former spa town and to do any souvenir shopping. Moffat is not technically in the Scottish Borders but is in located nearby in the region called Dumfries and Galloway. 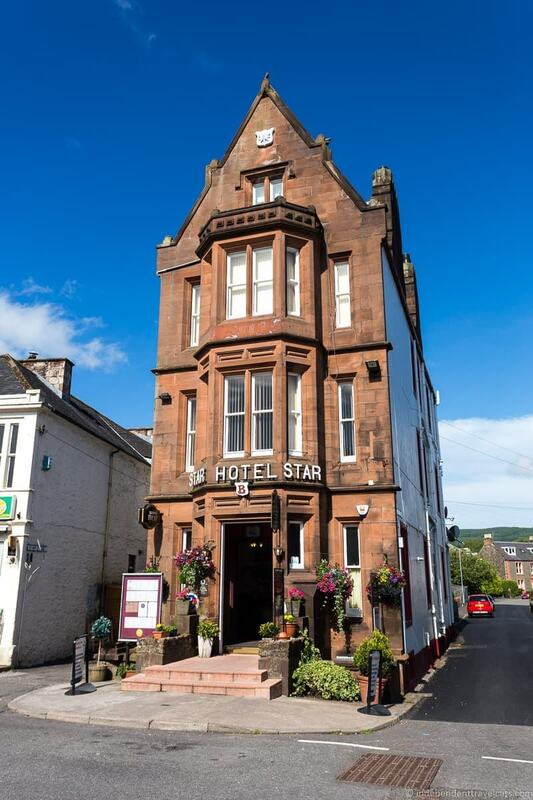 Moffat has a long history as a spa town, reaching its height of popularity during the Victorian period. 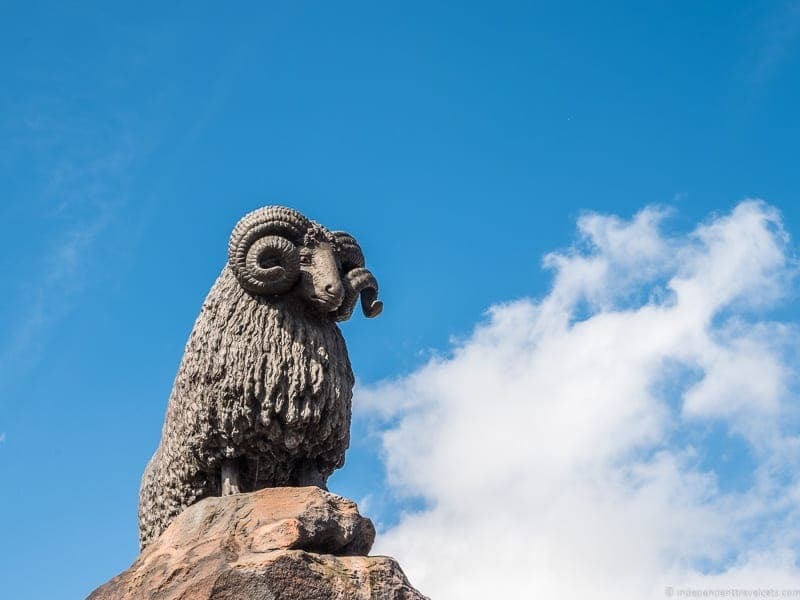 Moffat also had a notable woolen industry which is today commemorated with a statue of a ram by William Brodie in the town’s marketplace (poor ram has no ears!). The town center is worth a wander and you can stop and sample some of the Moffat toffee. If you like strange records, you can walk over to the Star Hotel which was in the Guinness Book of Records for being the most narrow hotel in the world (also serves food), Chapel street which is the shortest street in Scotland, and Syme Street which is the narrowest street in Scotland. For those interested in long distance walking, Moffat is also the starting point for the Sir Walter Scott Way. One of the great things about Rabbie’s tour drivers/guides is that they know where the best viewing spots are for great scenic views and photography. All of the tours we have taken have included at least a couple of photo stops, and the Scottish Borders tours were no exception. Ally made several photo stops across the two tours, which included the beautiful Scott’s View of the Eildon Hills (a favorite view of Sir Walter Scott), Devil’s Beef Tub near Moffat (a deep hollow formed by 4 hills), view at Carter’s Bar, and the countryside around Smailholm Tower. So as you can see we had two wonderful and very full day trips out to the Scottish Borders. Obviously we had limited time in each of the above places given this was a bus tour, but we had enough time to visit most of the places we wanted and an idea of all the places we want to explore further in the future. Although we have much more we’d like to see in the region, we got to see a lot of the highlights of the Scottish Borders and Hadrian’s Wall on these two tours! Have you been to the Scottish Borders? Which of the above places are on your list of places to visit when you come to Scotland? As always, feel free to comment and we’re happy to answer any questions about our Scottish Borders day trips with Rabbie’s. 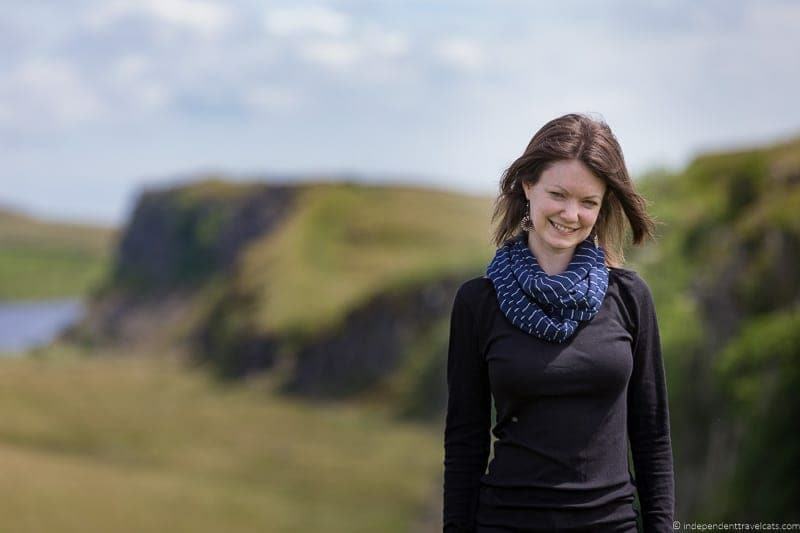 I enjoyed reading about your travels in the Scottish Borders–an area I’ve never visited. I definitely want to make another trip to Scotland and your blog has been an inspiration. Thank you. Rabbie’s tours really packs in a lot to see, and it sounds like the guide was extremely knowledgeable. From what you show us in the photo of Jedburgh Abbey, I can see why it’s such a good place to visit. I’d love to explore that place further. The viaduct would be another top pick for me. I don’t think I’ve actually seen a picture of Hadrian’s Wall before. If no one told me what it was, I’m not sure I would have guessed how significant it is. What a great idea, and I love the fact the company just started wiht one man and his van. We spent all of our time in Scotland in the Highlands. You’ve given me several awesome reasons for a return trip, this time to the Borders. 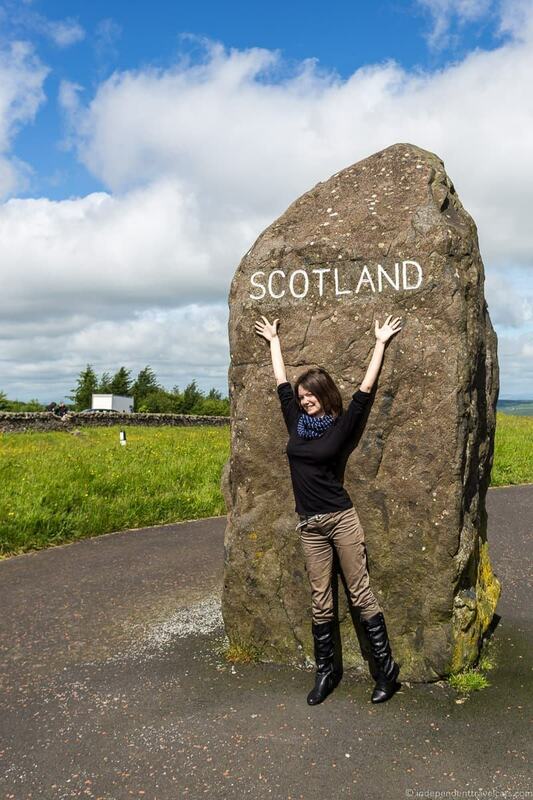 What an interesting post about the Scottish borders and the history! I have found the history so interesting ever since I read the Outlander series back in college! I’ve been to Scotland a couple of times – Glasgow, Edinburgh and the Highlands – and was absolutely wowed by its beauty! Especially the Highlands. The Scottish Borders look enchanting as well. Not a Games of Thrones fan but Hadrian’s Wall does look like a really interesting place to visit. Will definitely put the Borders on the list for the next time I visit Scotland. Thanks for sharing! I love your photos, guys! They transport me to the very places you visit and I feel like I was there with you, enjoying all these beautiful landscapes in Scotland. I’d love to visit Scotland and hope to be as lucky with the weather as you were. 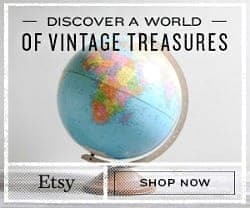 It’s great to know there are so many fun day trips from the big cities. We love taking small tours like this. We took one like this when we were in England, I’m sure that when we make it to Scotland next summer we will be using these guys. Thanks. 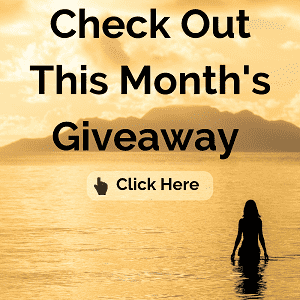 Really enjoyed this post, especially since I will be roadtripping to Scotland in a few days. The Mary Queen of Scots Museum sounds really interesting. I am in the middle of reading the book The Other Queen which is about her. I need to hurry up and finish it so I can visit the museum! I’ve really wanted to visit this area but hadn’t found much information about the Scottish Borders area before. This post was great, thank you!